Here is a Pyrenean desman showing off his funny nose. 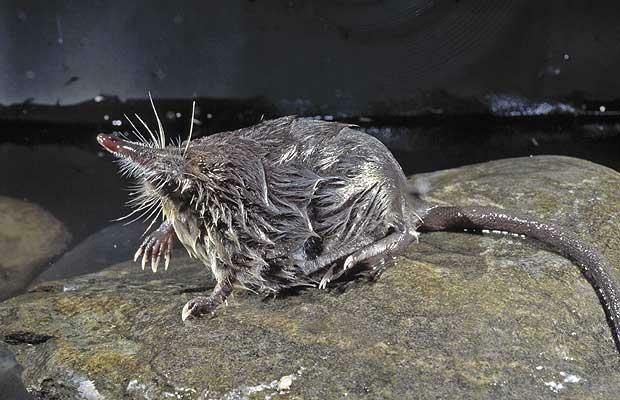 Today I want to write about a cute little mammal, the Pyrenean desman. These cute little guys are closely related to moles and measure about 16 cm long and have a tail that is about the same length. Pyranean desmans are very well suited to hunting in water at night, with webbed back paws, nostrils and ears that can close underwater and a long sensitive nose that they use to detect their prey. They eat insects, snails, shrimp and other small invertebrates. Pyranean desmans live in pairs and can breed more than once every year, with 1-5 babies born with each litter. They live in the mountain streams of Spain, France and Portugal. They are considered vulnerable to extinction due to damage to their environment and introduced species. Are there any other interesting facts that you would like to share about Pyrenean desmans? Great information. Its really sad that they are in vulnerable stage to extinction because of water pollution. We need provide a good habitat in order to protect them otherwise some day we only see them in pictures only.